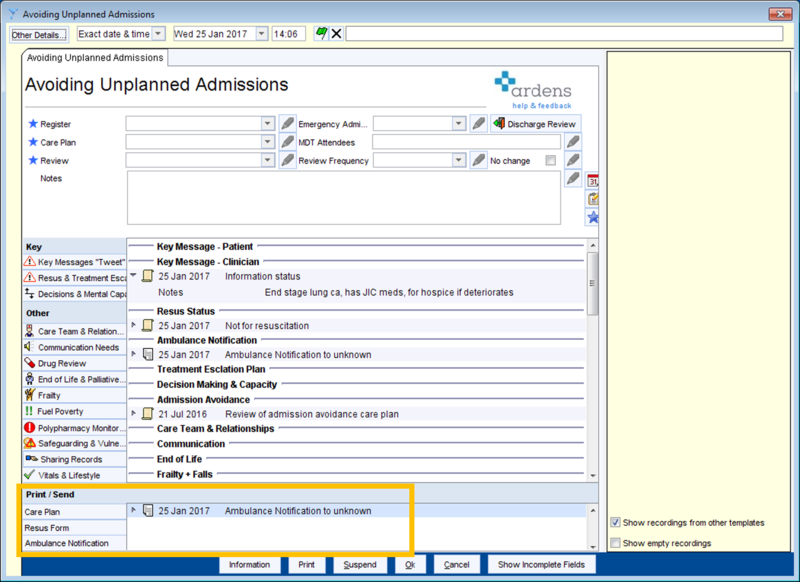 Sending important care plans and notifications to OOH or Ambulance Trusts by NHSmail is easy using Ardens. Open either of these templates by going to auto consultations > ardens General or by clicking the icon under the patients name. Then click the links on the left of the template to add information onto the care plan. In the bottom left of the template you’ll see a link to ‘Print/Send’ these. If you click one, all the information will be merged on to the word document. You can amend it if needed and then ‘Save As Final Version’. You’ll see the letter then appears in the view at the bottom of the template (see below). Then just right click it and select ‘Send Via NHSmail’. In the address book click the ‘CCG Contacts’ tab and find OOH, SWAST or the ambulance service entry under ‘Community’. Double click it to send the email. If the ‘CCG Contacts’ tabs is not active in your area, simply create a new entry in your own address book with the email address linked to it. TIP: Right click the address book entry and ‘Add as Favourite’ so it appears at the top of your address book for easy access next time.